Oh how I wanted to like these pencils. You guys know how much I dislike Prismacolor due to their quality control issues. If you’re not sure what I’m talking about, check out this video. 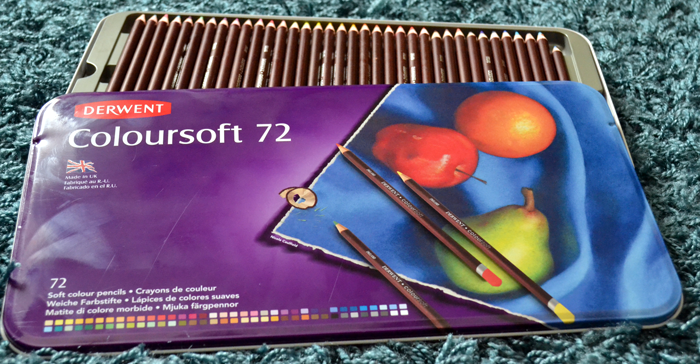 I read somewhere that Derwent’s Coloursoft were supposed to be Derwent’s answer to Prismacolor. I’m not sure if this is true or was something that the interwebs just made up to be honest. Either way I expected a similar product. I paid just under $85 for my set of 72 colored pencils. That seemed like a decent price if the pencils were going to be halfway decent. Now I had to spend some serious time looking for the lightfast measurements on this set. Derwent used to have a chart on their website showing how each pencil ranked. They don’t anymore. I did find a copy of it and found that 14 of the pencils in the set were not lightfast at all. I figured I could just pull those colors and add the rest of the pencils to my collection. The unfortunate thing here was that almost all of the purples and pinks in the box had to be pulled. We were not off to a great start, but I could still deal with that. I drew out my hummingbird onto a piece of one of my favorite types of paper, the Fabriano Artistico Extra White Hot Pressed 140lb watercolor paper. 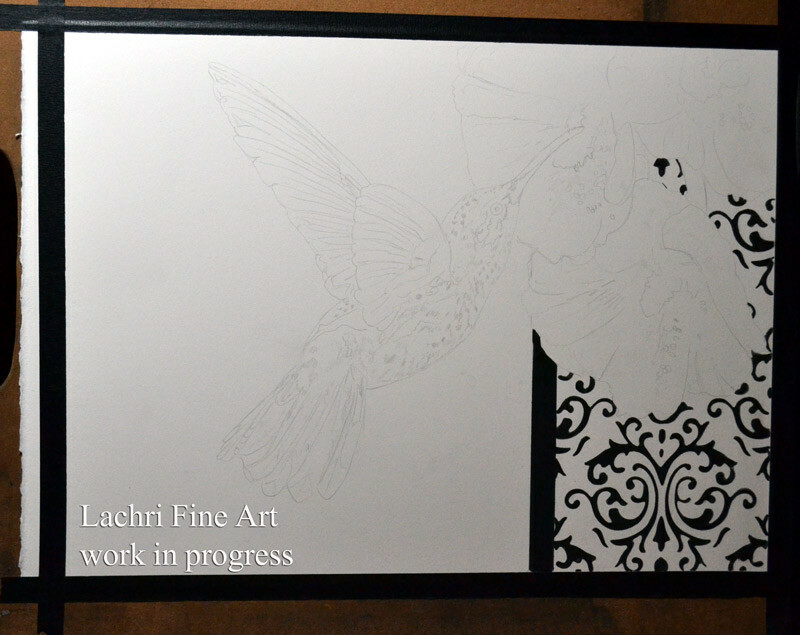 I actually went into auto drive and completed the damask portion with my Polychromos black. While this was not my intent, I was pretty glad I did because I later found out that these pencils were not great for detail at all, so those fine lines would have been nearly impossible to achieve with the Coloursoft. No big deal, most people aren’t trying to get that sort of stenciled look. As I usually do, I started with my background. I wanted a soft, out of focus look here so that my hummingbird would be pushed forward. While I don’t expect the colored pencils to be quite as soft as the look I get with the airbrush, I still expect to be able to layer and blend. Given that these are wax based, this should be one of their strong points. NOPE! These pencils do not layer well. They create a sort of hard wax that doesn’t really allow other colors to stick to. Now to be fair, some colors were worse than others with this. The Pale Blue that I wanted my base layer to be was HORRIBLE. Fine, no big deal, when I go over this area with white, that will soften it all up. Wrong again! The white in this set was terrible. 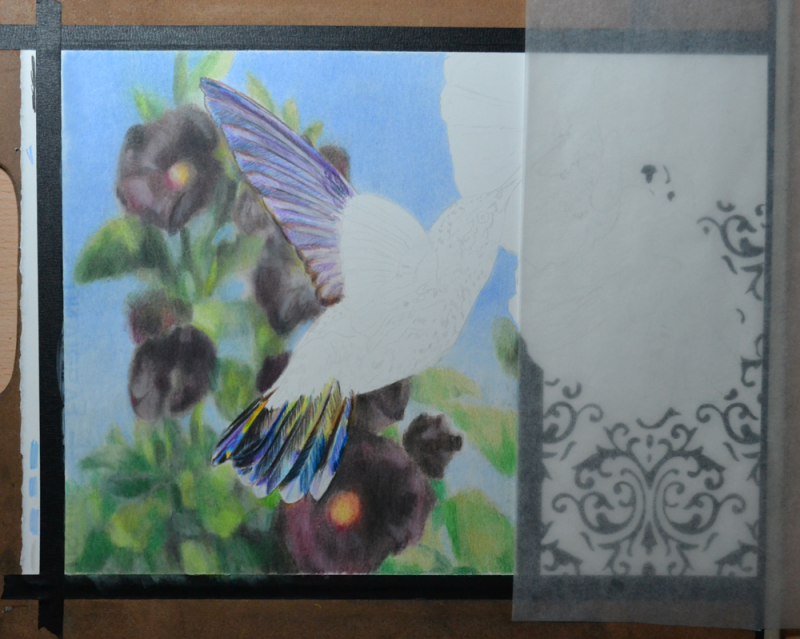 It was transparent and did not blend like other wax based colored pencil’s I’ve used. With most colored pencils, I can easily get 20 or so layers. I lay 3 layers of color down, blend with paint thinner, lay 3 or 4 more layers, blend with paint thinner, rinse and repeat. The paint thinner did not have much impact on the majority of these colors. Some of the darker colors were decent, but not the blue. As I started working on the green blurry leaves, the layering issues became even more apparent. They were painfully bad. No matter what I did I couldn’t get rid of that grainy look. Oh, and the “softness” of the pencils that is supposed to be a great selling point…yeah, scratchy, crumbly or gritty would be more accurate. There were a few colors that felt soft, but there was no consistency from color to color. The pigment in many of these colors was not impressive. SO many of these pencils seemed to be more hard wax than pigment. After attempting to blend the left-hand side of my background with a combination of paint thinner and burnishing, I decided to give Derwent’s own blender and burnisher a try. Maybe these pencils just depend on those tools right? Yep, same bad results. It was the most maddening experience for me. I’ve been working with colored pencil for 20 years and NEVER have I had the problems that I was having with these. I’ve had a couple of artists mention “you just need to get used to them”. Why? Why would I waste my time “getting used to” a pencil that should work like other colored pencils. At this point, I spent a few hours searching the internet for work completed using these pencils. Know what I found? A lot of very talented artists with gritty/grainy looking work and not a ton of detail. Not detail in the way I expect a pencil to be able to get. I mean that’s one of the best things about working in this medium…it’s easy to get really fine detail! I’m certain that every one of those artists would have far better results if they used a higher quality pencil. Every piece I saw that I felt was a good example of what colored pencils could do turned out to be completed with a combination of Coloursoft with another, higher quality pencil. Once I got to the hummingbird, my opinion didn’t get any better. These are terrible for detail. Even the waxy Prismacolors that aren’t great at holding a fine point are superior to the Coloursoft in this. I finally had to accept that these pencils could not do what any of my other colored pencils could. Once I got to the hollyhocks in the foreground, I just burnished the heck out of them and went for harsher lines and didn’t worry too much about detail. I am pretty sure I could do as good of a job with Crayola’s. These pencils were SO not worth the $85 I paid for them. I never thought I would see the day when I would recommend Prismacolor over another name brand colored pencil…but that day has come. As much as I don’t like the issues with Prismacolor wood casings breaking, at least the lead in those is more versatile. You can get beautiful blending with them and they are great for portraits. These I wouldn’t even dream of wasting my time with again. Given the choice though, I will happily stick to my Luminance by Caren d’Ache and Polychromos by Faber-Castell. This set is headed to my 6-year-old nephew to play with. I’m pretty sure they will be fine for his batman coloring book. They can’t be all bad though, so let’s be fair. As I worked on this piece, I was considering possible reasons someone may like these pencils. My first thought was that they hadn’t had much experience with better pencils, but there has to be more than that right? These layed down color quickly. They didn’t take many layers well, so I got this piece done in about 2 nights worth of work vs what would normally have taken me 4-5 if I could have really focused more on layering, color, and details. Of course that means my piece was inferior to my other work, but if you’re trying to get something done quickly…like maybe clothing design, or small color compositions, these pencils should work quite well for that. Plus with work that is not intended to be framed and sold, you wouldn’t need to worry about those 14 or so colors that were not lightfast. You can use them all! If I didn’t need to fill in a soft, multi-colored background, (or if I had just wanted one solid color), this would have looked MUCH better. Again, going back to the thought that simple illustrations would be better for these pencils. They erase!! That was one thing I liked with these. They erase far better than any other pencil I’ve used. I mean not as much as a graphite pencil, but still better than I would expect from colored pencil. They don’t break as much as Prismacolor (but they still break, crumble and have the lead fall out more than Luminance or Polychromos which I’ve never had break on me). The tin box is pretty. I wanted at least 5 positives for this list and ran out of options. If these pencils cost closer to $30 I would think they were worth the cost, but at $85 USD, they are seriously overpriced considering they can’t touch what other brands can do. These go on my list of supplies I will not allow students to use in my class. It concerns me that they are pushed so heavily in the UK. How many artists have tried them, realized they couldn’t get the results they wanted with them, and given up on the medium all together thinking all colored pencils were like this? I nearly gave up on colored pencils early last year because I was so sick of fighting with breaking Prismacolors and their horrible, splitting casings, and those weren’t nearly as bad of an experience for me as working with these pencils. The 1 hour and 20 minute version of the hummingbird demonstration is available for Patreon supporters now!